Even though it was years ago that I discovered the abundance of yoga and meditation classes offered at the University of Redlands, it didn’t occur to me to take one until earlier this year. I immediately fell in love with yoga, and although my newfound involvement in the Meditation Room piqued my interest in meditation, I never got around to taking a class before I graduated this spring. So, when I heard that Joshua Pollock, a Heartfulness Meditation trainer, practitioner, and co-author of The Heartfulness Way: Heart-Based Meditations for Spiritual Transformation, was going to pay a visit to the U of R to discuss his book and lead the audience in a Heartfulness Meditation session, I knew my opportunity to try meditation had finally arrived. At the event, Jennifer Downey, principal librarian at the A.K. 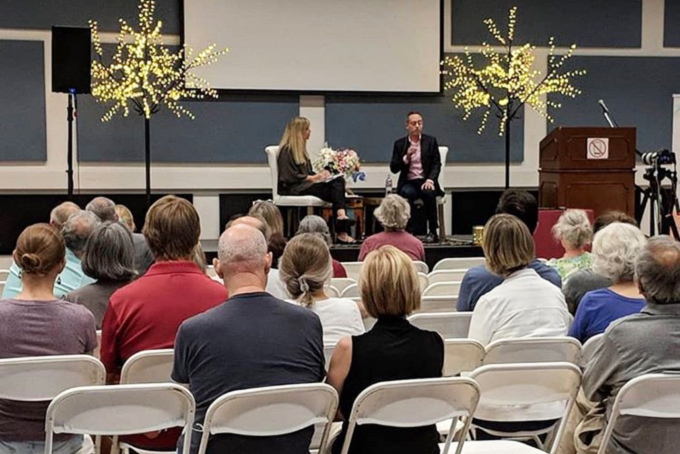 Smiley Public Library, interviewed Pollock about his book, which is written in the form of a conversation between Pollock and his Heartfulness teacher Kamlesh D. Patel. Patel, widely known as Daaji, is the fourth guru in the Heartfulness lineage. Why meditate? According to Pollock, meditation grants one stillness, stability, and, in the case of Heartfulness Meditation (a style of meditation that focuses on the heart), the ability to transcend reactivity—to be able to accept and respond to things without reacting to them. “When I speak of reactivity,” Pollock said, “I’m mostly talking about emotional reactions [harbored] from the past.” Pollock referred to these feelings as residual emotions, which are also known as samskaras, or impressions. These impressions, so long as they continue to put a filter over the way we perceive the world around us, drive our thoughts and behaviors in the present. Downey pointed out that meditation, which can be a lifelong process, doesn’t match up with the Western idea of setting a goal and reaching it, and asked for advice for those who are struggling to sit down and meditate. When Downey inquired as to how Heartfulness can help humans strive toward peace on a global scale, Pollock pointed out that humans don’t even have peace within their individual selves. The evening concluded with a short session of Heartfulness Meditation. Pollock first helped the audience to relax; we closed our eyes, and listened as he gently told us to relax our toes, then our legs, and all the way up to the tops of our heads. He instructed us to focus on the heart—not to visualize it, necessarily, but to focus on the feeling. We then began to meditate, and, although there were dozens of people present, it was a very individualized experience. For me, it felt euphoric, in a way, and I managed to hold on to this feeling so long as I didn’t go chasing stray thoughts. The experience was similar to bordering on sleep, but not quite allowing the dreams to take over just yet. Upon concluding the session, the room felt calmer, and I took that sense of peace home with me for the evening.